The iPhone 7 has been through a lot of rumors lately, and it’s not stopping any time soon. 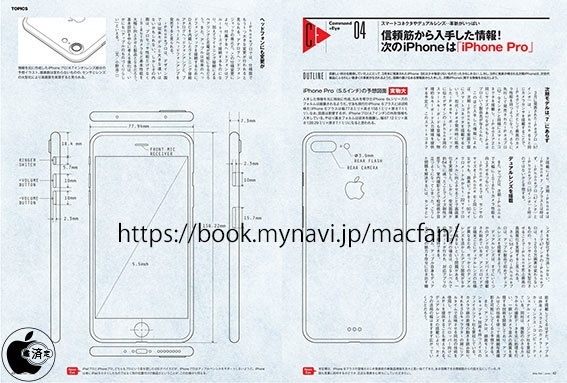 A Japanese magazine called Mac Fan has brought to the public an alleged schematic for the successor of the iPhone 6s Plus. It could be called the “iPhone Pro” or “iPhone 7 Pro” but whatever the name is, let’s check out what information it’s bringing us about the upcoming iPhone. Actually, the information that the schematic shows isn’t too far from the current rumors spreading around recently. There’s no 3.5mm headphone jack at the top, which entertains the idea of needing to use the Lightning port for our wired headphones. The back is quite different though compared to the previous iPhone versions. Firstly, there’s a camera set-up which allows for dual cameras to be placed in. This is an old technology which started from HTC a long time ago, we think that Apple isn’t getting any new innovations for the coming iPhone. There are three dots at the bottom which could be for wireless charging. Rather than having it built-in, Apple might offer a case which allows the iPhone 7 to have Qi wireless charging. This is thought to be the remedy for when the Lightning port is in use and you have to charge at the same time. We’re hoping that they finally integrate wireless charging into their device to help advance the standard. Although these enhancements are great, do we think that it’s enough of an upgrade from the iPhone 6 or 6 Plus? At the moment, not so much. But we would love to be proved wrong and be shocked with whatever Apple has up their sleeves.